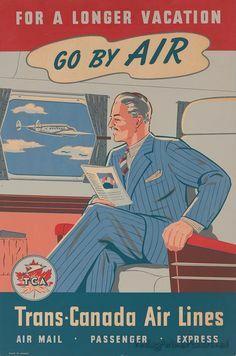 Before it was known as Air Canada, Canada’s major airline was called TCA or Trans-Canada Air Lines. The leading railway companies in Canada — particularly Canadian Pacific and Canadian National — played an early major role in connecting the far-flung dots within that country’s vast borders. In 1937, one of those rail companies, Canadian National, in an effort to diversify, formed TCA thereby filling another vital transportation niche to serve Canada’s expansive geography as well as beyond. In 1965, TCA changed its name to Air Canada. These stylish travel posters from before 1965 (when its name was changed to Air Canada) harken back to TCA’s first few decades as a national flag air carrier. These are fascinating – images of a more innocent age, when travel was less frenetic (and possibly more civilized) than it is today. Speaking of travel, Brett, maybe you could dig up some promotional material about Canadian Pacific’s “The Canadian,” Canada’s first stainless steel transcontinental train. I believe it had its inaugural run on April 24, 1955 – 60 years ago last month. The train is still operating, but now by VIA Rail. The equipment has, of course, been refurbished and upgraded – and I’m certain the dome cars are as enjoyable today as they were back then! I love these old posters. Airlines were magical back then. Air travel is quite a bit different now! I don’t have to tell you I love these. Love these posters! My father-in-law used to work for TCA back in the day. I wanted to let you know that I have occasionally stopped by your blog in the past and enjoy it. As a Canadian living close to the US border, I often blog about America – kind of the opposite of you! Thanks for your nice comments, and I love that your blog concept!